This website is owned and operated by DK Las Vegas, LLC, a Nevada-based real estate sales company. We operate this website as well as those of our affiliated properties that are all located in the United States. Those websites include https://theonelv.com, https://ogdenlv.com, and https://juhllv.com. DK Las Vegas takes your privacy very seriously. We are committed to protecting and safeguarding the privacy of visitors to our websites including mobile versions of our websites. If you have any questions, comments, or requests regarding this policy or the information practices of DK Las Vegas, please contact us using the contact information below. This website is owned and operated by DK Las Vegas, LLC, a Nevada-based real estate sales company. We operate this website as well as those of our affiliated properties that are all located in the United States. Those websites include https://theonelv.com, https://ogdenlv.com, and https://juhllv.com. DK Las Vegas takes your privacy very seriously. We are committed to protecting and safeguarding the privacy of visitors to our websites including mobile versions of our websites. If you have any questions, comments, or requests regarding this policy or the information practices of DK Las Vegas, please contact us using the contact information below. If you do not agree to this Policy, please do not use DK LAS VEGAS websites OR PROVIDE DK LAS VEGAS WITH YOUR PERSONAL INFORMATION. Your use of DK Las Vegas websites and/or mobile applications indicates your acceptance of this policy and of the collection and use of your personally identifiable information in accordance with this policy. We may collect different types of personal and other information based on your use of our products and services and our relationship with you. Personal information we may collect includes contact information such as your name, telephone number, e-mail address, city, state and zip code. When you visit our websites, we may collect certain information by automated means. For example, our systems may collect information about your activity on the websites (i.e., pages you visit, address of a referring website (if any), identifiers for your mobile device, geographic location information, and Internet Protocol address) for a number of purposes. Such information is collected using automated technologies such as cookies. A “cookie” is a text file that our website would send to your computer or mobile device to identify your browser or to store information or settings in your browser. We may use this automatically-collected information to track engagement with our websites. We also use this information to operate, maintain, and manage our websites. If you would like to avoid cookies, view our site in “privacy mode” or change the settings in your browser to not accept cookies. Click on the “Help” section of your browser to learn how to change your cookie preferences. We use Google Analytics to gather anonymous analytics and statistics about our websites and how they are being used by our visitors so we can improve our websites. • Comply with applicable laws and as otherwise allowed by law. DK Las Vegas does not sell, trade, transfer or share your personal information with third parties. We may share your personal information with our other communities and properties that are part of DK Las Vegas. We may be required to share your personal information for purposes such as complying with court orders or law enforcement; assisting with identity verification, and to prevent fraud and identity theft; selling DK Las Vegas’ assets; or enforcing our agreements and property rights. We don’t knowingly collect personally identifying information from anyone under the age of 13 unless we first obtain permission from the child’s parent or legal guardian. If we become aware that we have inadvertently received personal information provided by a visitor under the age of 13 without permission from a parent or legal guardian, we will delete the information from our records. A child’s parent or legal guardian can also request that the personal information of their child be deleted from our records. We are concerned about ensuring the security of your personal information. Your personal information is collected and stored in a secure cloud database. We use industry-wide, standard, commercially reasonable efforts to protect your personal information from access, loss, misuse, alteration, or destruction by any unauthorized party. These include physical, electronic, and managerial procedures to safeguard and secure the information we collect. There is no 100% secured platform available in the industry and we cannot guarantee the security of the information, nor can we guarantee that information you supply in connection with use of the websites will not be intercepted while being transmitted to us over the Internet or wireless communication. Any information you transmit to the websites is at your own risk. We do not promise, and you should not expect, that your personal information or private communications will always remain private. We honor Do Not Track signals and do not track, plant cookies, or use advertising when a Do Not Track browser mechanism is in place. We may offer links to sites that are not operated by DK Las Vegas. If you visit one of those linked sites, you should review its privacy and other policies. We are not responsible for the policies and practices of other companies. DK Las Vegas uses a variety of social media options to communicate and interact with consumers, and has links to certain social media providers available on its websites. When interacting with a DK Las Vegas presence on those social media websites, you may opt to reveal certain personal information. We may collect the personal information that you make available to us on that page or account, including any information you have made public in connection with that social media service. Any personal information you have chosen to share on any DK Las Vegas social media pages will be visible to persons visiting those pages, and privacy on those pages is governed by the privacy policies of those social media companies. Other than to respond to posts or answer questions, DK Las Vegas will not use personal information provided on its social media pages without permission from you. We may contact you by email or other means at an email address that you have provided to us. If you do not want to receive email from us, please “unsubscribe” through the link that is included in our emails. Your personally identifiable information may be transferred to, stored, and processed in a country other than the one in which it was provided, including into the United States. By communicating electronically with us, you acknowledge and consent that your personal data is being processed in this way. If you are a California resident and have an established business relationship with us, you can request that we provide certain information about our company’s sharing of personal information with third parties for direct marketing purposes. We do not share any California consumer personal information with third parties for marketing purposes without consent. California residents who wish to make this request may contact us using the contact information below. No Federal agency has judged the merits or value, if any, of this property. No statement should be relied upon except as expressly set forth in the Nevada Public Offering Statement. This is neither an offer to sell, nor a solicitation of offers to buy, any condominium units in those states where such offers or solicitations cannot be made. WARNING: THE CALIFORNIA DEPARTMENT OF REAL ESTATE HAS NOT INSPECTED, EXAMINED, OR QUALIFIED THIS OFFERING. Pricing and locations of units are subject to change without notice. Views and locations of units within the project are not guaranteed and the buyer is responsible for inspecting the unit and its location before signing any agreement with respect thereto. Any square footage numbers are approximate. © DK Las Vegas Residential, LLC. Unauthorized use of the images, artist renderings, plans or other depictions of the project or units is strictly prohibited. A DK LAS VEGAS LLC COMMUNITY. Homebuyers on the market today have varying needs which dictate the size of their dream home. And like Goldilocks, there is always one size that’s “just right.” Whether buyers are seeking a smaller floorplan with reduced maintenance that more easily accommodates a “lock and leave” lifestyle, or more room for entertaining and visiting guests, “right-sized” homes come in all varieties, with Downtown Las Vegas condominium communities offering both large and small options. The Ogden redefines condo living with spacious floorplans, proof that vertical living doesn’t mean you have to downsize. Even if homebuyers aren’t completely convinced with high-rise living, The Ogden may just be the property to quickly convert them, especially once they see the open design of floorplans, stunning views and rich lifestyle created by a long list of amenities and immediate access to all that Downtown Las Vegas offers – from 150-plus restaurants, world-class museums and more. “For buyers not wanting to compromise on space, The Ogden offers a handful of larger floorplans, including The Goodman, just shy of 2,100 square feet. The inviting layout lives like a ranch house in the sky with three bedrooms plus a den, two balconies offering Strip and Downtown Las Vegas views and a gracious kitchen with a granite countertop island with additional storage space and a window over the kitchen sink facing The Strip. Available only on higher floors, The Goodman provides ample space to accommodate an in-home office and is perfect for entertaining overnight guests,” said Vaknin. And with all the growing buzz surrounding sustainable living, there’s no better way to do your part than by becoming a high-rise dweller. More condominium properties are also expanding their environmental initiatives to include rooftop gardens, utilizing renewable energy and more eco-friendly building materials, in hopes of inspiring residents to continue to do their part in reducing their carbon footprint and improve environmental efficiency. “At Juhl, residents enjoy a nearby garden plot exclusively for their use. We want to do everything possible to encourage our residents to grow their own fruits, herbs and vegetables. Evelyn Connors, Juhl’s own lifestyle director, has even hosted ‘garden brunches’ and they’ve always been a huge success!” said Vaknin. On the south end of Las Vegas Boulevard, the twin-tower high-rise community of One Las Vegas easily trumps the notion that condominium living means cramped living quarters with few amenities. With several floorplans ranging from 1,305 to 2,857 square feet, One Las Vegas has a home for just about everyone. 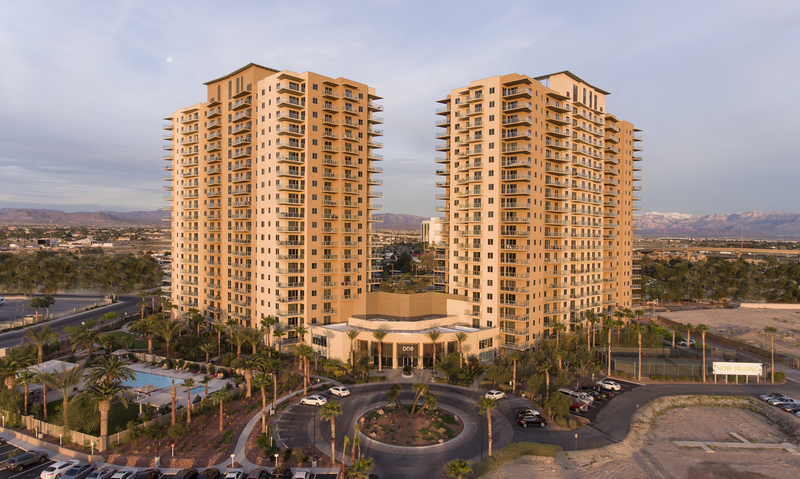 And at 20 stories high, residents enjoy sweeping valley, mountain and Strip views – conveniently located close to freeways, shopping, dining, entertainment, hospitals and McCarran International Airport. Best of all, One Las Vegas is less than five miles from T-Mobile Arena, home of the Vegas Golden Knights, and only a few miles from the developing NFL Raiders stadium. And to the delight of all residents, every home comes with its own climate-controlled full-sized storage unit to accommodate extra belongings, making the transition to condo life smooth and easy. What properties are you interested in? Terms and conditions may vary. Subject to underwriting approval. Pricing and offer subject to change. See agent for details.